Telemedicine is affordable and convenient healthcare. Think of it as a "doctor in your pocket", accessible at any time. It connects you to nurses and doctors for live consultation, referrals, prescription renewals and more. 1. How do you define telemedicine? 2. What does telemedicine do for you? Easy access and convenience for your healthcare needs. Most employees have to change their own schedule or take time off to get a medical appointment. Not with telemedicine. It is a flexible service that works around your busy life. Many Canadians postpone appointments because of time constraints or possibly even cost concerns. Telemedicine is affordable when compared to many private options out there and allows for timely treatment. 3. When would I use telemedicine? You work at small business with 10 employees. You work at the office 9-5 and get a 1 hour flexible lunch break. Last night you came down with chills but think nothing of it. Today, you show up to work and feel sick. You work through the day but productivity goes down as you're feeling sick. Tomorrow, you will have to take time off work to visit your family doctor, assuming you can find a spot. In most cases, you have to book in advance to get a time or alternatively, wait long hours at a walk-in. Instead of spending the entire day waiting in line at a clinic, you could spend 15 minutes of your 1 hour lunch break and talk to a medical professional through your mobile device. A virtual clinic can treat you and provide any prescriptions (as needed). The best part? Prescriptions are shipped to your house or office, free of charge. Imagine the time saved and the immediate relief on the same day for a simple 15 minutes off work. You could even decide the next day whether to stay home and relax if things get more severe, or show up to work knowing full well you are already treated. 4. What features can patients access with Dialogue? 5. What is the popularity behind telemedicine? 6. What can telemedicine treat? 7. What should you look for in a telemedicine service? Dialogue is a secure and leading virtual healthcare service with one of, if not, the largest number of active medical professionals. It uses proprietary technology that continuously improves based on client and patient feedback. On top of that, many other telemedicine services do not offer pricing for 1-10 businesses. Most require a minimum of 20 employees. 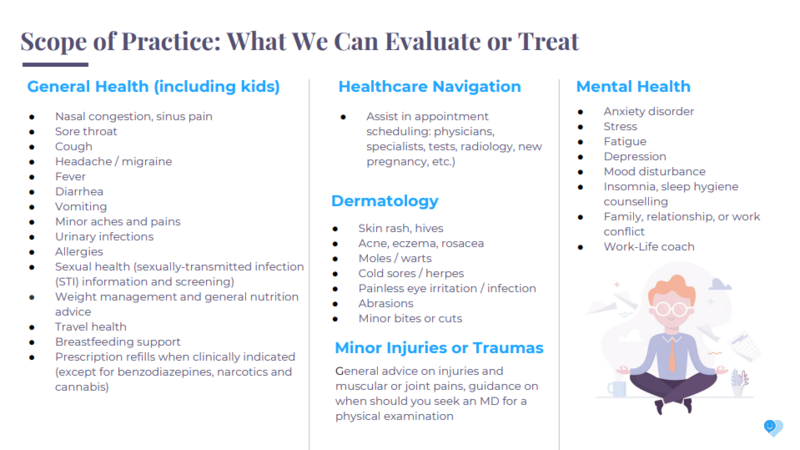 These are just some of the aspects you should search for, in a telemedicine company. Other things like privacy concerns, number of doctors and nurses, and overall website organization are key indicators as well. 8. Can I use telemedicine when travelling overseas? This depends on your provider but in most cases no, due to varying laws for physicians as well as licensing restrictions when prescribing abroad. Dialogue, specifically, only offers its services within Canada (aside from the NWT). 9. What are the hours of operation for telemedicine virtual healthcare? This depends on your provider. Dialogue's care team is available 8 AM to 8 PM, Monday to Friday and 10 AM to 4 PM Saturday and Sunday. Some employers decide to offer 24/7 coverage to their employees, simply log in to your account to check your eligibility. 10. How do I access telemedicine? It ranges from plan and provider. For Dialogue, you will be sent an email to access your account after your employer signs up and the plan is processed. Telemedicine describes a type of service. While there may be some providers or government sponsored plans offering a free service, they are often limited in many aspects such as no video chat or only nurse consultations. Dialogue is not free. Consult with your employer if you wish them to sponsor a plan on your behalf. 12. How is it different from a walk in clinic or family doctor? Dialogue will not affect the relationship you have with your family physician. Our doctors are here for non-urgent cases, in between your yearly physicals. Telemedicine services are a great supplement to a walk in or family doctor visit. 13. Is telemedicine private / secure? This varies by provider. Dialogue is one of Canada's leading providers of telemedicine services. They are committed to information security and protects personal information and PHI through integrated, physical, technological and administrative safeguards. 14. Can I add dependents to my plan? Yes, you and your family are covered. Dependents are included.